There is just enough awareness about cluster headache and other headache disorders to prompt volumes of bad information to spread all over the internet, bookstores, and mainstream media outlets. It seems as though everyone is out to make a quick buck off the suffering and desperation of hurting patients. You've likely run across dramatic claims of "cures" such as ear piercings, soaking your feet in hot water, drinking lemon juice and salt water, purple lemonade, or green smoothies. With so much information out there, how will you ever know what is accurate? Download this easy-to-use symptom tracker to record the frequency and severity of each attack. Download this easy-to-use form to record and track your medication history. Download this letter to explain cluster headache to your loved ones. 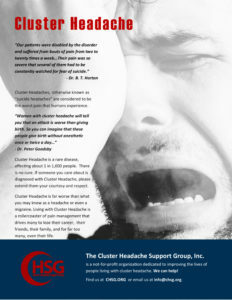 Download this letter to explain cluster headache to your employer. Download this letter to explain cluster headache to your child's school. Created by cluster headache patient, Bob Kipple, the KIP Scale was created specifically to describe the pain of a cluster headache attack. Download this detailed pain scale that offer descriptions of functioning as well as pain intensity.